Garba Touré and his guitar were a familiar sight on the banks on the Niger, upstream from Timbuktu in Mali, West Africa. But when armed Islamist jihadists too control of Northern Mali in the spring of 2012, he knew it was time to leave. The hard­line Islamist gunmen drove music underground. The penalties for playing or even just listening to it on your mobile phone were a public whipping, a stint in an overcrowded jail or worse. Like thousands of refugees, Garba grabbed a bag, his guitar and boarded a bus to the capital Bamako. Arriving with some other musician friends from the north, they decided to form a band. “We wanted to recreate that lost ambience of the north and make all the refugees relive those northern songs”. That’s how Songhoy Blues were born. “Songhoy” because Garba Touré, lead vocalist Aliou Touré and second guitarist Ou­ mar Touré, although unrelated to each other – Touré is as common as Smith or Jones in northern Mali – all belong to the Songhoy people, one of the main ethnicities in the north. And “Blues” not only because northern Mali is the cradle of the blues and its music is often referred to as “the desert blues”, but also because Garba and his mates are obsessed by that distant American cousin of their own blues, “my father used to make me listen to Jimi Hendrix who I love.” Garba’s father is Oumar Touré, who played congas for Mali’s guitar legend, Ali Farka Touré. 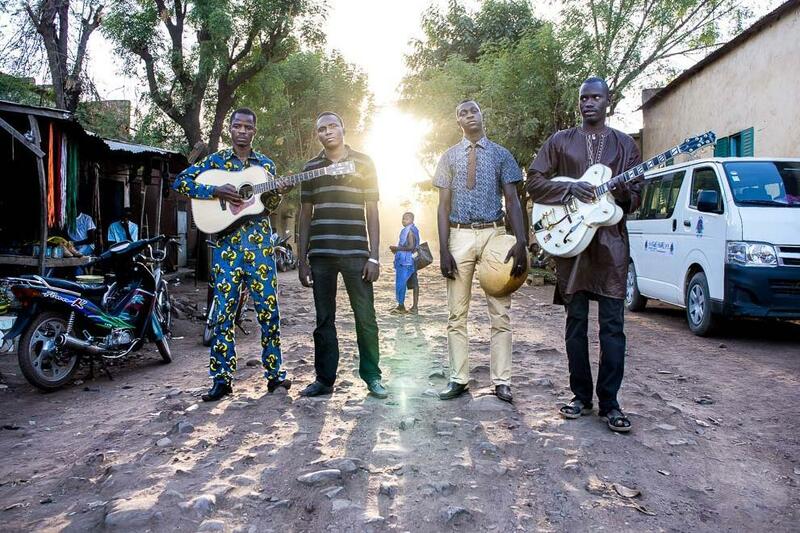 After signing up drummer Nathanael Dembélé, Songhoy Blues hit the Bamako club circuit with their raucous guitar anthems dedicated to peace and reconciliation. People flocked to see them, not only fellow Songhoy people, but also Tuareg and other northern ethnicities. Even southerners came. Anybody familiar with the enmity between the Songhoy and Tuareg peoples will appreciate how inspiring it must have been to see Tuareg and Songhoy youth wigging out together in a Bamako bar. In September 2013, a group of European and American musicians and producers were coming to town under the banner of Africa Express to make an album with local musicians. After passing an informal audition with Brian Eno and Damon Albarn, Songhoy Blues were introduced to Nick Zinner, leader of US band the Yeah Yeah Yeahs. “The very next day we went into the studio and did some takes with Nick. He’s a very simple person; a great guitarist but really modest”. Africa Express invited the band to London to appear at the launch of the ‘Maison des Jeunes’ album, the band’s song ‘Soubour’ featured as it’s outstanding track, released by Transgressive Records in April 2014. It was to be the first of many trips to come, with the band returning in August for a whirlwind nine day adventure shooting music videos and performing to a full house at Visions Festival in Hackney, as well as their own London headline shows at Servant Jazz Quarters in Dalston and Momo's in Regent Street. These performances were filmed to be a part of a feature length documentary 'They Will Have To Kill Us First' being made about the musicians of Mali and the consequences of the conflict which focuses on Songhoy Blues and their unique story. The band were promptly signed by Transgressive and completed a full album recording in New York, London and Mali with Nick Zinner at the production helm. This is penned for release in early 2015.